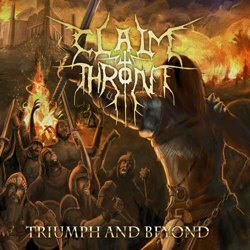 Claim the Throne is an Australian epic folk death metal band from Perth. They were formed in 2005 and in 2008 their debut album “Only the Brave Return” was out. Next year they signed to Prime Cuts Music and released the EP “Aletales” (miniCD + DVD). In 2010 their second full-length album “Triumph and Beyond” was out again via Prime Cuts Music and finally I got it in my hands. If you have listened to the band’s debut, you won’t believe your ears with this new work! The band has undergone several line-up changes and everything is improved. Claim the Throne offer us epic melodic metal with many death metal and folk elements. They don’t try to re-invent the genre, nor do they play something you listen for the first time, but they have composed a very enjoyable album with many wonderful songs. Their music is based on their melodic guitar riffs, accompanied by epic and sometimes majestic synths, folk instruments and acoustic guitars. Their production is closer to mainstream and their sound is very solid. Their music though requires even better sound quality in order to listen to every detail of their rich orchestrations. They use various vocals styles, ranging from passionate expressive epic black / death metal screams to clean male and female vocals; some of their male clean vocals though still need improvement. Their compositions are quite different; there are fast epic bombastic songs, slower ones with a folk approach and a few acoustic ballad-like songs. I prefer their epic and more aggressive songs and my personal favorite is the same titled “Triumph and Beyond“! The album lasts for 48 minutes, including 10 songs, plus 2 bonus tracks (re-recorded songs of their previous works). “Triumph and Beyond” is a really good album that fans of epic folk death metal should check! Claim the Throne are already preparing their third album, which will be released next year. I hope the band improves a bit the production and makes a better filtering in its songs removing the few indifferent moments from its music. I believe they have everything it takes to create a truly remarkable album and I am really looking forward to their upcoming work. ”Triumph and Beyond” is released in digipak edition with 12-page booklet via Australian label Prime Cuts Music. You can visit the links to their official pages below to get a taste of their music.